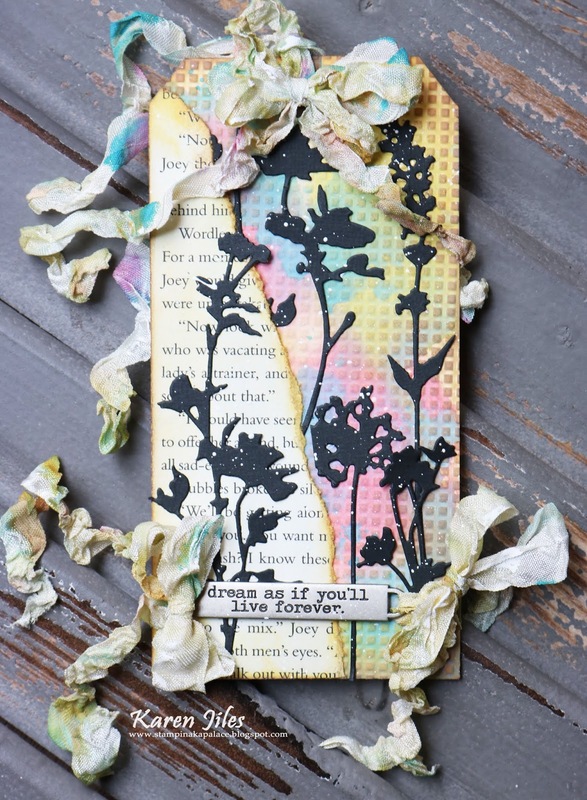 It’s Karen, sharing a Mixed Media Tag that I created with the Cut N Boss Machine and the Design Grid Embossing Folder. I love this versatile folder. It adds just the right amount of texture and the distressed and aged techniques I used created a great vintage effect. I added some book paper to create a fun versatile layer and I enhanced the overall design by tapping on some gesso using a paintbrush. Take a peek at the super easy tutorial below. Step 1: Place inked manila tag in the Design Grid embossing folder and run through the Cut N Boss machine. Remove embossed tag from the embossing folder. Step 2: Using a blending tool, distress the edges of the tag using coordinating oxide inks. Step 3: Adhere floral die cuts to the tag. Step 4: Tear a piece of book paper, distress the edges and adhere the book paper onto the tag. Add additional floral die cuts to the tag. Step 5: Add ribbon and word band to the tag. Highlight ribbon with gesso. Tap gesso over tag using a paintbrush. I hope that this "Dream" Mixed Media Tag has inspired you. Love all the details! Great techniques and elements!